Friday A.M. Friday P.M. Saturday A.M. Saturday P.M.
Paper: "The Creation of a Festival Orchestra: The Performer's Field Guide to Music Festival Foundation"
Paper: "Salomé: The Fetishization of the Veil and the Power of the Gaze." Paper: "Secular Monophony in the Middle Ages: Women Composers in the North and South of France." Paper: "A Model of Triadic Post-tonality for a Neoconservative Postmodern String Quartet by Sky Macklay"
Lecture Recital: “New Music for Viola by Victoria Bond and Chih-Chen Wei"
Lecture Recital: "You Score Like a Girl! 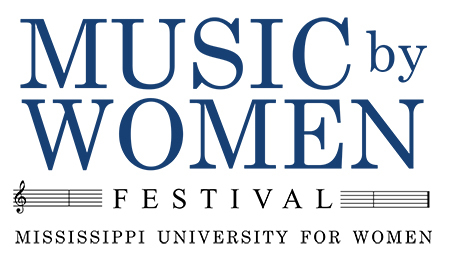 The Current Plight of Female Film Composers"
Ross Smith (Centenary College of Louisiana); Assisted by Michaela Brantley, Gabriela Giamalva, Chelsea Glaspie, Brittany Wagner. Lecture Recital: "Libby Larsen's 'Me: Brenda Ueland'"
Paper: "The Choral Works of Queen Lili’uokalani: Indigenous Feminism, and Performance Practice"
Lecture Recital: "The Art Songs of Rachel DeVore Fogarty: An Analytical Approach to Performance Practice and Prosody." Lecture Recital: "The Flute Music of Anna Bon di Venezia: A Lecture-Recital"
Panel: "The Emotional and Intellectual Impact of Singing Art Songs by Women Composers: A Pedagogical Perspective"
"Music for Woodwind Trio by American Women Composers"
Paper: "Gendered Nationalism and Female Agency in Amy Beach’s Eskimos"
Lecture Recital: " Forgotten Voices: An examination of Black Louisiana Creole Folk Songs through the Works of Maud Cuney-Hare and Camille Nickerson"
Lecture Recital: "The Legacy of Harpist and Composer Henriette Renié (1875-1956)"
Paper: “The Black Swan: The Life and Career of Singer Elizabeth Taylor Greenfield"
Lecture Recital: "Clairières dans le ciel by Lili Boulanger: An historical and analytical study"
Lecture Recital: "Four-Handed Literature by Women Composers"
Paper: "From Piano to Percussion: Vivian Fine, Zita Carno, and Gitta Steiner Compose for Paul Price and the Newly Emerging Percussion Ensemble"
Lecture Recital: "Songs of the Boulanger Sisters"
"Through the Ages: Music for Women by Women"
Paper: "Mastering Atonal Voice Leading as an Undergraduate: Utilizing Standard Curriculum in Learning Atypical Repertoire"
Paper: "Women Composers in Choro"
Lecture Recital: "Duft by Kaija Saariaho: Creating Harmony within a Solo Voice"
Lecture Recital: "The Sonata for Viola & Piano by Marcelle Soulage"
Paper: "Singer, Composer, Pedagogue: The Life and Works of Pauline Viardot"
Lecture Recital: "Female Poets Featured in Japanese Art Song Anthology Volumes I and II"
Lecture Recital: "Jocelyne Binet’s Cycle de Mélodies: Unearthing a Forgotten Song Cycle"
Lecture Recital: “The Clever Artifice of Harriet and Margaret From the Script to the Score: How to Write a Libretto, Score, and Produce a New Opera"
Paper: "'Tentative and Feminine': Viola Sonatas by British Women"
Paper: "Amy Beach's Cabildo: An American Opera"
Lecture Recital: "Saving Our Own Lives: Art Songs by African-American Women Composers"
Lecture Recital: “The Inspiration of Western Canada on Three Distinctive Women Composers"
Lecture Recital: “The Music Salon of the 19th Century and its Importance in the Lives of Women Composers"
Lecture Recital: "Being Part of the Solution: A Guide to Commissioning New Music"
Lecture Recital: "Women's Words: Selected Songs by Josephine Lang, Amy Beach, and Libby Larsen"
III. Grace and Prescott Ave.